A few weeks ago I took a week staycation. It was lovely to have time off to do nothing. To refresh and recharge, and overall relax for more than a day at a time. I was hoping that by April I might have at least one or two decent days to do some stuff outside. Unfortunately, to say that the weather did not cooperate would be the understatement of the year. The entire week was so cold, and rained or snowed most days. At the end of the week we had a sleet/hail/snow storm with tons of school, church and work activities were cancelled. I was quite disappointed with the whole weather situation. But that's April in Michigan for you. You never know what you're going to get. Due to the nasty weather, I was able to enjoy a few extra coffee shops as there was not a whole lot else I wanted to do! It was the perfect weather for that at least. 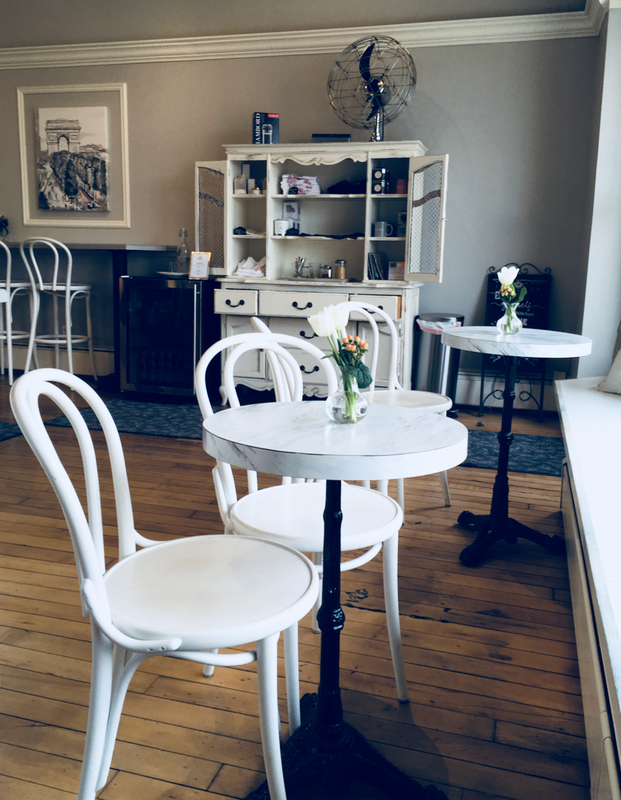 Lara and I also took a morning for a special afternoon tea at one of our favorite spots, the cutest little macaroon shop just down the street called Le bon Macaron. 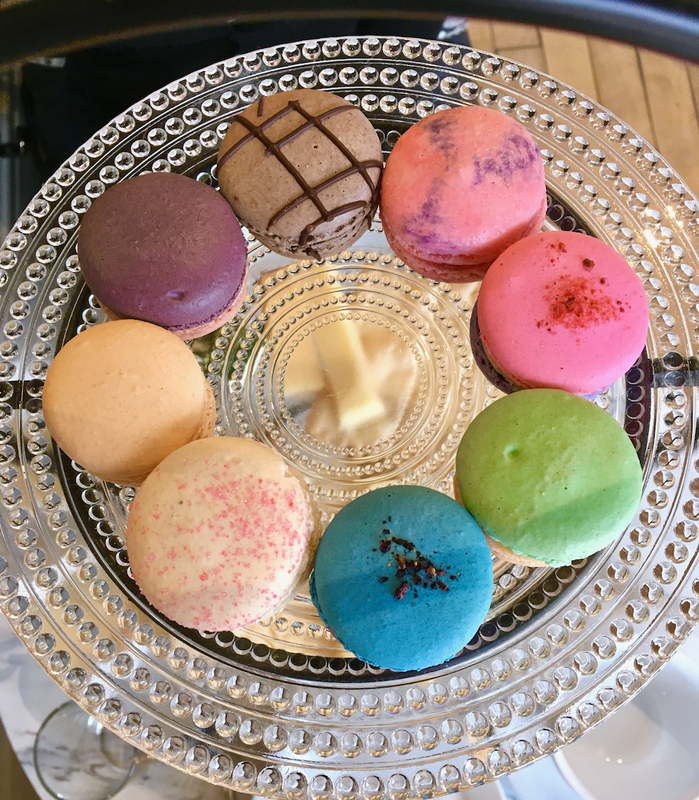 If you are ever in Grand Rapids, Ann Arbor or in East Lansing where their other shops are located, I highly recommend a stop for some of the best macaroons you'll ever had. They are fantastic. And the whole shop is styled in the cutest French inspired way. A pleasant way to spend a morning or afternoon. Our "tea" consisted of scones, crackers, cheese, tea, and macaroons. So good, and so fun! Overall, I tried to make the best of the less than ideal week! Good coffee certainly helps! Finally got over to the West side of Grand Rapids to check out a new coffee shop called Corridor Coffee. It's a very cute little place with a lot of charm. The actual coffee is not the best I've had, but I'd go back for the atmosphere for sure. 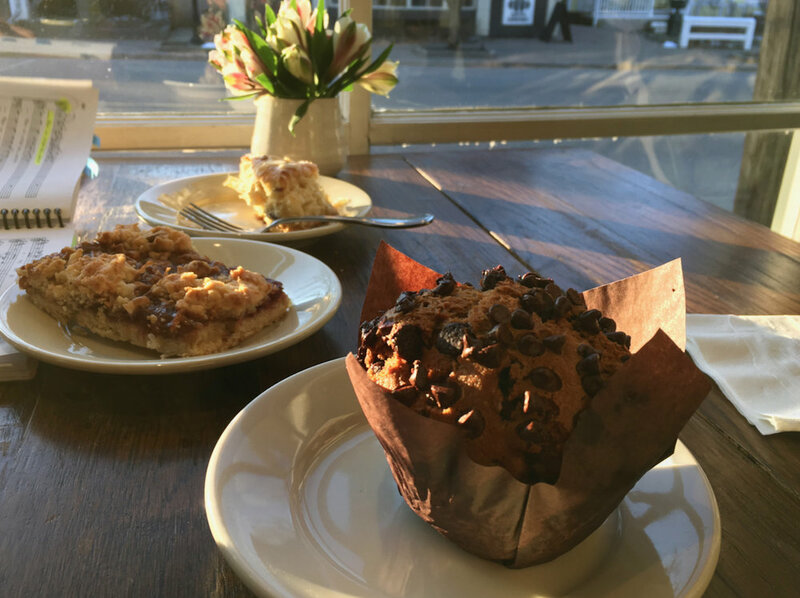 And they sell some delicious local baked goods, some that are allergy friendly if that's important to you. Tea Time at Le bon Macaron! Such fun, and delicious! Really the best macarons I've had. They know what they're doing, and the shop is the most adorable place you could imagine. Did just a little bit of work as well while on vacation. Not ideal, but at least I found a cozy place with delicious coffee to make it more palatable. 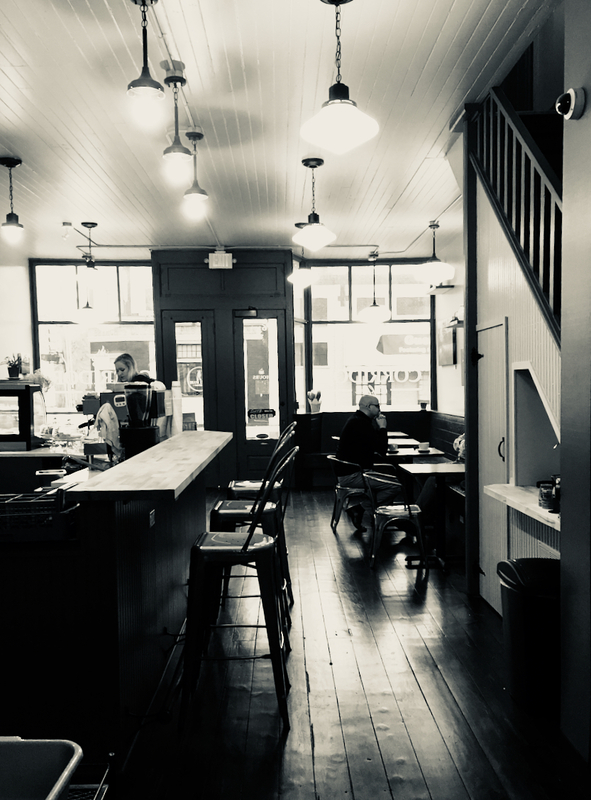 Lightfast Coffee is another great place in Grand Rapids. If you look beyond the coffee in this picture you can see the lovely weather I was up against this week... ick. Finally a sunny day! It was cold, but beautiful! Went out for breakfast with my mom to Nonna's Pantry in Ada for some delicious baked goods. All house made and delicious. The coffee was nothing special, but altogether a lovely morning. Here's a no-brainer cookie to try out ASAP. Naturally sweetened, full of whole grains, healthy fat and protein. Need I say more? Well, one more important thing I suppose, they're delicious! The most important point in my book. While I love eating healthy and feeling good about my food choices, if they don't taste good I'm not interested. They have to be both. Have no fear, these cookies definitely are. I love me a hearty, filling cookie. I'm also addicted to peanut butter, and go through a Costco sized package of rolled oats on my own very quickly. These two ingredients are the star of this recipe. Add a little apple, a little banana, and a little honey and you're golden. Give it a shot and tell me if you agree! These cookies don't have an egg or gluten which always makes me a little nervous when waiting to see how well they will stick together. These cookies pass the test with flying colors. They are nice and sturdy, not all crumbly and delicate. The peanut butter and the sweeteners help with this. You can go ahead and add in any number of mix-ins to suit your taste preferences. Obviously chocolate will be the best choice (😊) put choose your own adventure! Preheat oven to 350 degrees. Line a baking sheet with parchment paper and set aside. In a medium bowl, mix together the peanut butter, mashed banana, applesauce, and honey until smooth and well combined. Add the oats, chia seeds and salt and mix. When mostly combined, add and additional add-ins that you desire and continue to mix until a uniform dough forms. It will be soft and sticky. Using a cookie scoop, or a pair of spoons, transfer dough to cookie sheet to form 10-12 cookies. Flatten the tops of the cookies with a few wet fingers if desired (the cookies will not really spread much with baking). Bake shaped cookies for 20-25 minutes, until edges are just slightly firm to the touch. Remove from oven and let cool on baking sheet for a few minutes. Then transfer to a wire rack to cool completely. My sister served me this bread last week for breakfast and I enjoyed it quite a bit, so this weekend I decided to make myself a loaf. It's a wholesome chocolate banana bread made with whole wheat flour and Greek yogurt. When eating a breakfast bread, I like like having a nice thick slice; something I can really sink my teeth into. This bread is perfect for that. And topped with a little peanut butter for a little extra protein umph is my favorite way to finish it off! I streamlined the original recipe here, just so I didn't have to use as many bowls! Mix the wet ingredients in one bowl, the wet in another and mix them together. Done. I also did what I seem to always do and cut back on the sugar from 1/2 c honey, to 2 tbs honey + 2 tbs brown sugar (so 1/4 cup total). Feel free to double this for a sweeter and more indulgent bread. Preheat oven to 350°F. Lightly grease and flour a 9x5-inch loaf pan and set aside. In a medium bowl, whisk together the flour, cocoa powder, baking powder and salt, set aside. In a large bowl, beat together the remaining ingredients until well combined. Add the dry mixture to the wet mixture and mix with a spatula until mostly combined. Add in the chocolate chips or chocolate chunks if using, and continue to mix until completely combined with no more streaks of dry flour in the batter. Batter will be thick. Spread batter evenly into prepared loaf pan. Press more chocolate chips into the top of the batter before baking, if desired. Bake on the middle rack of the oven for about 50 minutes, turning halfway through, or until a toothpick inserted in the center of the loaf comes out with a few moist crumbs. Let the bread cool in the pan for about 20 minutes before removing to a wire rack to cool completely and serve. I ran across this lovely recipe a few weeks ago and was very intrigued. I knew right away that I needed to try it soon, and I'm so glad I did. Today I'm sharing an interesting but simple recipe from Claudia Roden, a well loved food writer and cookbook author, especially known for her writings on Middle Easter food. What initially peaked my interest was the fact that this recipe calls for whole oranges, that you boil for several hours, and then puree directly into the rest of the batter, skin, pith, flesh and all! And besides this strange (at least to me) method, the rest of the recipe is simple, with few ingredients. Sugar, eggs, an almonds. That's basically it. The finished cake is dense but incredibly moist, full of texture and flavor. The whole orange imparts just a slight bitterness to the cake that is balanced nicely with just the right amount of sugar. The almonds add richness, as do the eggs which also help with the structure a little. The orange flavor is, not surprisingly, very pronounced (with whole oranges and all!). A small slice of this cake for breakfast, or after dinner for dessert, is refreshing and satisfying. Delicious on its own, or my favorite way with a nice spoonful of plain yogurt on the side for a creamy and smooth contrasting element (I decided to try this out on my own and thought it was amazing!). I ended up halving the original recipe, and baking it into a small, 6 inch, cake. Perfect for me and a few friends. Feel free to double the quantities below and bake in a larger pan (I imagine 8 or 9 inches would be good). I highly recommend having some nice and thick plain Greek yogurt (make sure it's plain, the contrast with the sweet cake is ideal) on the side. I'm sure a little whipped cream would also be nice, but just a bit richer/heavier. Wash and boil the orange (unpeeled) in a little water for 1 1/2 - 2 hours, until very soft. Let cool. Preheat the oven to 375°F. Grease a 6 inch cake pan. Cut open the cooled orange and remove the seeds. Place orange in a food processor and process until smooth. Add the sugar and process again until well combined. Then add the eggs and process once more. Finally, add the almonds and baking powder and process until everything just comes together. Pour the batter into the prepared cake pan and bake for about 1 hour. If it is still very wet, leave it in the oven for a little longer. Cool in the pan before turning out. I'm a big fan of breakfast cookies. They are so fun, and delicious. I love being able to eat a cookie at any time of day or night. I've seen various cookie and bar recipes that incorporate some beans or legumes for a healthy protein boost and have been wanting to try it. I finally did with these cookies. 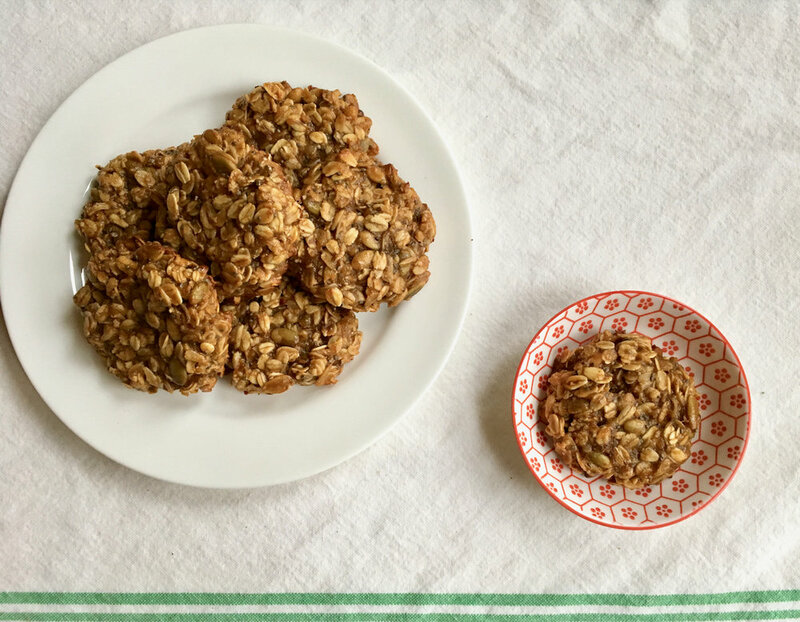 They start out seemingly like a pretty typical oat cookies, but then there's a little surprise; 1/2 cup cooked white beans! It's a nice little way to add some nutrition to your breakfast, but still make it feel like a treat. Once these cookies bake up, it really is hard to tell that there are beans mixed in. They do taste a little different than a "normal" cookie, but not at all in a bad way. They are delicious, and are a feel-good way to start the day. Enjoy! After I made these cookies I had a sneaking suspicion that I may have accidentally doubled the coconut oil... Oh well! I couldn't remember for sure how much I put in but it may have been 1/4 cup instead of the 2 tablespoons I call for. I'm going to have to try them again and find out. What a problem! Preheat the oven to 350 Degrees. Line a sheet pan with parchment paper and set it aside. Mix chia seeds and water in a small bowl and let it sit on the counter for 10-15 minutes. Meanwhile, process 1 1/2 cups of the rolled oats in a food processor until it turns into flour. Transfer it to a large mixing bowl. Stir in the rest of the rolled oats, baking powder, baking soda, cinnamon, and salt. Set aside. Place the white beans and coconut oil into the bowl of the food processor and process until creamy. Add in the chia seeds (with water), maple syrup, orange zest, applesauce, and vanilla extract. Pulse until everything is combined and it is smooth mixture. Pour the white bean mixture over the rolled oats mixture. Add in the chocolate. Stir to combine. Shape the dough into 12 equal balls and place them on the prepared baking sheet. Bake for 16-20 minutes, flipping the sheet halfway through the baking process. I recently stumbled over this recipe for a simple and nutritions blender muffin. I had a carrot in the fridge, and bananas turning brown on the counter so it was almost like it was meant to be! I went to work putting it all together and am glad I did. These muffins turned out delicious; light and moist, full of whole grains, healthy fats, fresh fruit and fresh veggies. How great is that? They are also made with no wheat flour, and no dairy, so if you are avoiding either of those this is another plus. They are not vegan due to the 2 eggs, but you could always try a vegan egg replacement if this is something you care about. I followed the original recipe other than decreasing the honey just a bit from 1/4 c to 2 tablespoons and didn't miss it at all. The bananas themselves are nice and sweet. I also had a little freezer jam hanging out that I decided to add to the center of the muffin for a little sweet surprise! You can't see it in the picture, but it's there, I promise! It's a fun addition if you have some extra jam lying around. If you use peanut butter as your nut butter it'll turn these muffins into a "PB&J muffin"! Yum! Preheat your oven to 350 degrees and prepare a muffin pan by lining the cavities with parchment paper liners or greasing them well with oil. Set aside. Add all the dry ingredients (oats through salt) to a high-speed blender, and process on high until the oats have broken down into the consistency of a fine flour. Add all of the remaining ingredients except for the carrots, and process on high until the batter becomes smooth and creamy, about 30 seconds. Periodically stop and scrape down the sides of your blender, if necessary. Transfer the batter to a medium-size mixing bowl and fold in the carrots by hand. Spoon the batter into the prepared muffin cups, filling each one about 3/4 of the way full. Bake for 16 - 18 minutes, until the tops of your muffins begin to turn golden brown and a toothpick inserted into the center comes out clean. Allow the muffins to cool in the pan for 10 minutes before transferring them to a wire rack to cool completely. I've got another great sourdough bread recipe today. It's a super simple loaf that comes together very quickly and bakes up beautifully. This bread slices up well and makes the best sandwiches. Made with a majority whole wheat flour for nutrition, but with a little white flour for optimal texture, it's just the right combination. I included a little butter for additional tenderness and flavor, and a little honey for just a hint of sweet, just how I like it. This recipe is great for me, allowing me to use up some sourdough starter without even thinking ahead since I used the cold starter straight from the fridge. Maybe sourdough purists would be appalled, but it works for me in my life and kitchen. If this sounds appealing to you, I encourage you to give this recipe a try. I got some GREAT oven spring out of this bread! It's always exciting to take that first peek into the oven about halfway into baking and see how beautifully tall the bread has risen above the top of the pan. It makes me so happy! This bread has a nice dark brown crust, with a fluffy and light interior, just fantastic. And it's a really easy and quick recipe as yeasted bread goes. I've managed to get it all done in 4.5 hours start to finish. You'll need about another 2 hours to let it cool before slicing, but overall pretty simple and quick. In the bowl of a stand mixer fitted with a dough hook, combine all of the ingredients. Mix in low speed until the ingredients are incorporated, adjusting the water as needed to achieve a medium dough consistency (you may need additional water). Continue mixing to in medium speed to a medium-high level of gluten development. Transfer the dough to a lightly oiled container. Cover and let rise until doubled in size, about 1 1/2 hours. Turn the dough into a lightly floured counter and shape into a tight loaf. Generously butter a 8.5 x 4.5-inch loaf pan. Place the dough, seam-side-down, into the prepared pan. Proof, covered, for 1 hour, or until the top of the dough has risen to about 1.5 inches above the edge of the pan. Meanwhile, preheat the oven, with baking stone on the bottom rack, to 425F. Once you are ready to bake, place loaves in the oven, reduce the temperature to 400 degrees and bake for 25 minutes. Take the loaf out of the oven, remove the loaf from the pan, and place it directly on the baking stone, and bake for approximately another 15 minutes, until the crust is a deep golden brown. Remove from oven and place on a cooling rack. Let bread cool completely before slicing. This bar is a version of my cranberry walnut granola bars, but I replaced the almond butter with peanut butter, and then obviously used chocolate chips instead of the cranberries and walnuts. Both good options, but when that chocolate craving hits there's only one option! Preheat the oven to 350 degrees. Butter a 12x9 inch or 8x8 inch pan, or line with a parchment paper sling, and set aside. Place the butter, and peanut butter in a large microwave safe bowl and microwave until the butter melts. Stir until the well combined. Mix in the honey, vanilla and salt and give a good stir. Add the egg and stir the whole mixture until smooth and combined. Add the oats, whole wheat flour, and chocolate and stir everything together until well combined and there are no more dry pockets of flour. Transfer the mixture into the prepared pan and pat down firmly into an even layer. Bake at 350 degrees for 25-30 minutes or until the top is golden brown. Allow to cool completely before cutting.